Microscopic description: The direct smears are cellular and show markedly atypical epithelial cells arranged both in cohesive sheets and in single cells. The cells show a range of sizes- most are moderately sized, but some cells are notably large. The nuclear-to-cytoplasmic ratios are increased and there is mild-to-moderate nuclear contour irregularities. 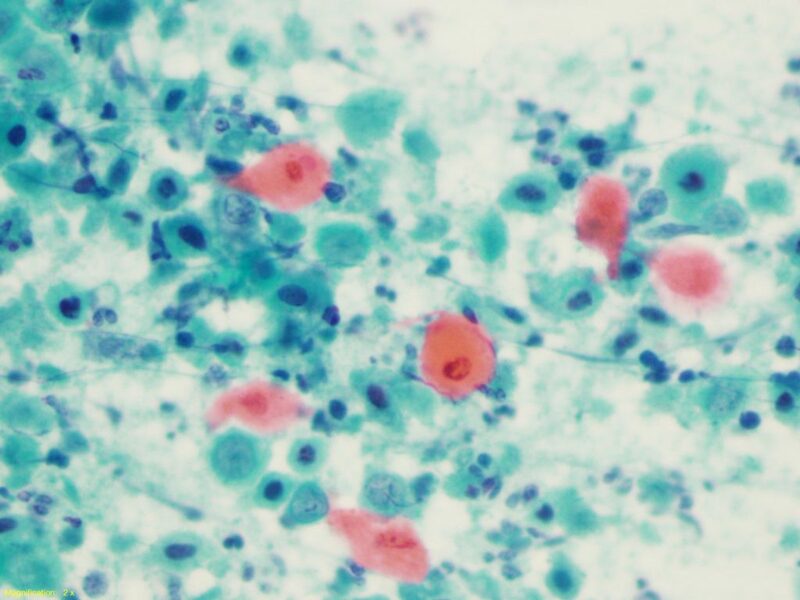 The cytoplasm is waxy/hard and is blue in color (often described as “robin’s egg blue”) in Diff-Quik stain. There are no cytoplasmic vacuoles or intracellular mucin. 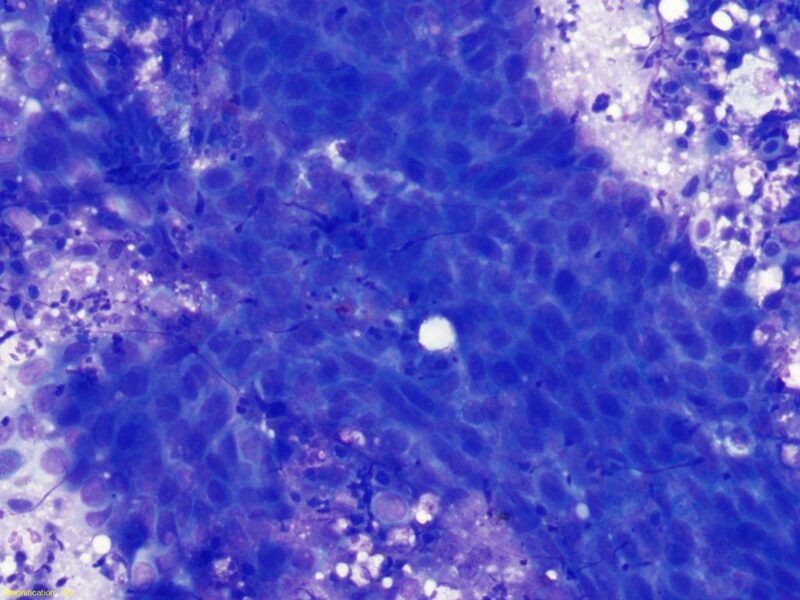 On the pap stain, some single cells have orangeophilic cytoplasm, indicative of a keratinizing process. The background is necrotic and acutely inflamed, consistent with tumor diathesis. Intercellular bridges may be seen on cell block preparations. Differential diagnosis: This specimen was obtained from a left supraclavicular lymph node. Supraclavicular lymphadenopathy is nearly always due to a metastatic malignancy. The differential diagnosis for supraclavicular lymphadenopathy differs based on the laterality of the node. Right supraclavicular lymphadenopathy is associated with metastatic malignancies found in the supradiaphragmatic region (esophagus, mediastinum, and lung). Left supraclavicular nodes are known as Virchow’s node and are associated with metastatic malignancies from the infradiaphragmatic region (via the thoracic duct). These malignancies include renal, testicular, GYN, pancreatic, prostatic, gastric, and retroperitoneal tumors. Lymphoma is also in the differential diagnosis for left supraclavicular lymphadenopathy. 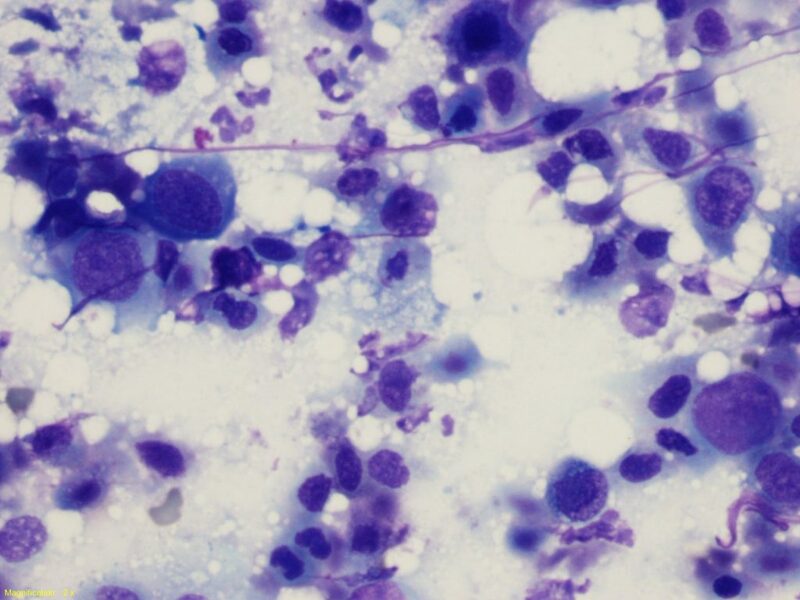 In this case, the patient presented with bilateral pelvic and left supraclavicular lymphadenopathy which showed metastatic squamous cell carcinoma. She had a reported history of squamous cell carcinoma of the uterine cervix. Please enter your email address to continue to the Johns Hopkins Cytopathology Case Conference website. We’d like to send you periodic updates regarding Pathology educational materials released by our department. You’ll hear about new websites, iPad apps, PathCasts, and other educational materials.